Will Microsoft gain more Office 365 users with Office for iPad? Microsoft’s CEO Satya Nadella hammered home this week the message of reaching out to IT professionals, end users and developers with its Office for iPad and Enterprise Mobility Suite. First, Microsoft revealed Office for iPad and its Enterprise Mobility Suite (EMS) to the IT community, including a free version of the iPad Office apps and full versions to Office 365 subscribers. Second, the company sent out an online promotion to customers offering a free year of Office 365 for the first 50 people who go to selected Microsoft retail stores. The hook is to be more productive by putting the iPad to work and getting Office on more devices. Next week Microsoft will host its Build Developer Conference in San Francisco to discuss its Windows development. And then the message circles back to IT pros with the North America TechEd 2014 conference in May. This three-pronged constituent approach could be Microsoft returning to its roots and ensuring its core enterprise IT customers are given top billing. For Nadella to highlight IT pros with the EMS package alongside the long-awaited Office for iPad, he’s capitalizing on both constituents to push his mobile and cloud first message. The industry has awaited Microsoft to launch an Office for iPad productivity suite. For years, Microsoft suffered through harsh criticisms for its lack of an offering and lost revenue on the industry’s most popular tablet. But now Microsoft can draw in new users and businesses not yet subscribed to Office 365 by baiting them with the Office for iPad apps. And here is where Microsoft’s strategy works. Not only do you get the business end user who wants to try Office 365 and Office for iPad but you also get IT professionals who are looking to try out the cloud-based service for their business for free. If these end users get hooked on Office 365, through the Office for iPad apps or just by using the cloud-based service, they may go back to their IT department and push to have their organization license the service. Buddy Newman, an IT manager for the Metropolitan Area Planning Council (MAPC), a state agency of 70-80 people based in Boston, wanted to compare Office 365 with his company’s current Citrix virtualized environment. Newman was unsure whether Office 365 would be cost effective, as previously, other cloud services Newman explored did not provide a cost benefit for MAPC. But Newman is willing to explore Office 365 for his business, especially since the promotion is free for a year. Other waiting end users were curious about accessing files across multiple devices. The ability to synchronize files across multiple platforms was key for Greg Imbrie, a doctor at Tufts Medical Center, a hospital based in Boston. In addition, since Imbrie already is a Microsoft Office user, he wanted to see if the functionality of his iPad could be improved with the new Office for iPad apps. Microsoft would not reveal how many stores in the U.S. were selected for the promotion. 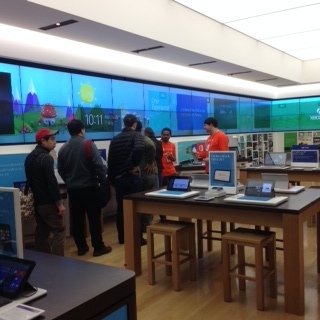 As of January 2014, Microsoft has 83 retail stores worldwide. Even if Microsoft only offered the promotion to 30 stores, it would cost about $150,000. That’s small change for Microsoft to continue seeding a market to IT professionals and business end users in the hopes of snagging new Office 365 subscribers. And what better way to do it than through an iOS tablet? It’s the new Microsoft.